The question of black money stashed away in Swiss bank was an important point of political campaign in the parliamentary election of 2009. A series of data regarding the size of black money was released by different political parties. Advani said "At a lower estimate, the amount of Rs 25 lakh crore which is secret foreign money is sufficient to relieve the debts of all farmers and to build world class roads all over the country, apart from providing safe drinking to six lakh villages in the country." Sharad Yadav the president of JDU claimed that Indian citizens had deposits USD 1,456 billion followed by Russia (USD 470 billion), UK (USD 390 billion), Ukraine (USD 100 billion) and China (USD 96 billion) in various foreign banks including Swiss bank. Professor R Vaidyanathan, (Professor of Finance at the Indian Institute of Management, Bangalore) estimated that Indian money stashed away may be of the order of $1.4 trillion (about Rs 71 lakh crore). The well-known tax havens are Switzerland / Liechtenstein / Luxemburg / Channel Islands etc. The question of repatriation of this unaccounted money arose because the United States government took some steps to retrieve such funds from Swiss Banks and Swiss government authorities. When India got its independence in 1947, it was a poor country lacking in wealth although it was very rich in natural resources. The process of wealth creation began at a fast pace. But, the rates of Income Tax in India were one of the highest in the world. This encouraged manufacturing of black money and its transfer to outside banks. It is really an enigma that India is a developing country but Indians have largest deposits of black money in Swiss Banks. If we examine this situation astrologically, the following observations can be made. The observations are based on the horoscope of India drawn on the basis of the birth of Independent India in the midnight of 15th August 1947. As per Vedic astrology, Jupiter and Venus both have been assigned the role of ministers in the cabinet of the Sun (king). When Jupiter and Venus are not well placed in the horoscope, it may indicate dubious role of the executives, administrators, ministers and the elite class of the country. In the horoscope of a nation the 2nd house represents wealth, the 3rd house represents business and enterprise, the 5th house is seen for stock markets and entertainment industry, the 9th house represents fortune and the 10th house represents occupations of the country. 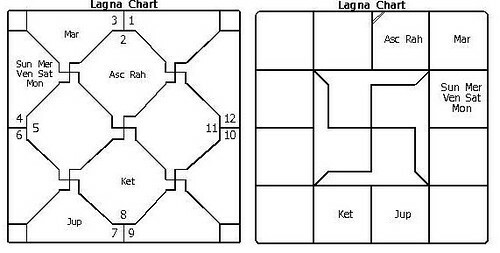 Similarly, the 11th house represents income and 12th house represents expenses and outgo of funds to foreign lands. The tenth lord in the horoscope of India is Saturn that happens to be placed in the 3rd house. Sun, Mercury, Venus and Moon are conjunct with the 10th lord. The 11th lord Jupiter aspects the 2nd house as well as the 10th lord Saturn. These placements indicate that the people of India will have varied vocations like agriculture, industry, mining, commerce, entertainment, flourishing media and IT sector etc. The people of the country will have presence in almost every field because of the influence of so many planets with the 10th lord. This will help in the process of wealth creation. Strong 3rd house indicates flourishing enterprises in the country. Saturn placed in the 3rd house indicates that India is a country which believes in the philosophy of hard work and is a country of hardworking people. The placement of Jupiter as the lord of house of gains in the 6th house is playing a dubious role. Firstly, 6th house being the house of debts, the placement of 11th lord in the 6th house increases the quantum of national debt which is a fact. The aspect of Jupiter on the 12th house further indicates that the national wealth will be siphoned off to foreign land. The ill-placed 2nd lord in the 3rd house is also an indication of pilferage of nation’s wealth. The lord of the 9th house is Saturn. Its aspect on the 12th house further aggravates the possibility of pilferage of wealth. Can these funds be brought back? Yes, it can be brought back by strong will of the government. Placement of Sun in the 3rd house and the start of the dasa of Sun from 12th September 2009 indicate that the government at the centre is strong enough to take firm decisions regarding repatriation of black money stashed in foreign banks. The dasa to follow is of Sun / Moon from 30/12/2009 to 30/06/2010 indicating that the government will initiate the process of dialogues with the Swiss Governments and Bank authorities during this period. Own sign moon in the 3rd house can give some diplomatic success in this matter. The next dasa is of Sun / Mars from 30/06/2010 to 06/11/2010. Mars being the 12th lord placed in the 2nd house may mean that some amount of repatriation of money stashed in Swiss Bank is possible during this dasa. Astrology can give only guidance. An honest attempt by the Government is required to bring back a part of our wealth on which taxes have not been paid to the government which is the reason for its categorization as black money.